With an OnTime subscription, you gain access to our always up-to-date suite of delivery software applications. Each of OnTime's programs provide the functionality needed by the individual roles that make up a successful delivery business. You may install the software on as many computers and devices as you would like, at no additional charge. OnTime Management Suite is a comprehensive application designed to address your business administration needs. This program is the hub for controlling your OnTime account and is generally used by managers, IT staff, report designers, and accountants. Information input into OnTime Management ahead of time will help to make dispatching simple and powerful. OnTime Dispatch software is generally used by order entry personnel, such as dispatchers and call center workers, to create orders, track shipments, and stay in continual contact with drivers. 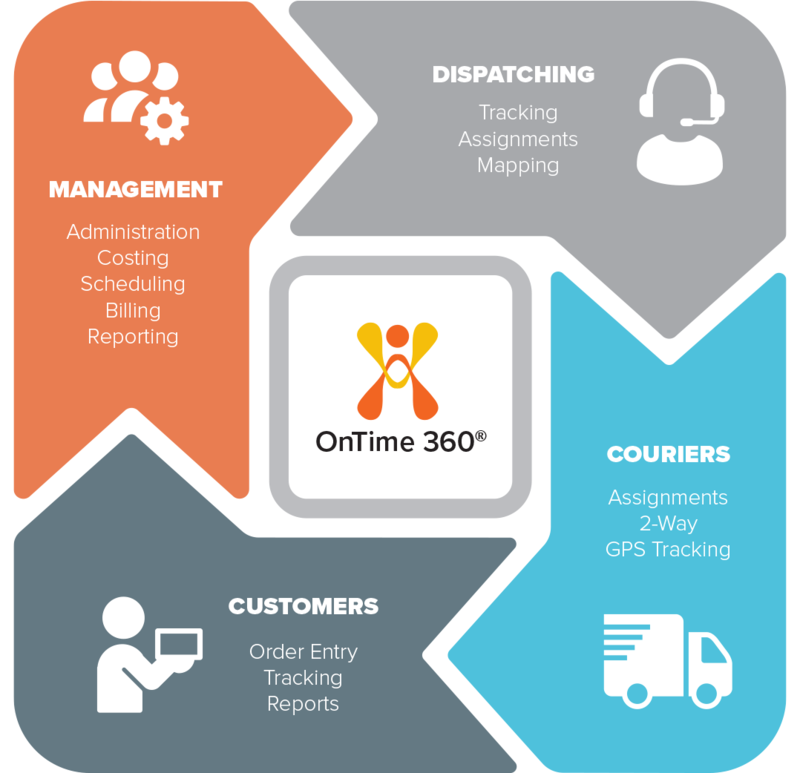 OnTime Mobile's on-the-road functions can help to improve your business's efficiency and customer service. This program is used by drivers to maintain a live connection to your office. The OnTime Customer Web Portal can be easily integrated into your website in minutes. With this program, you can allow your customers access to self-dispatching, an address book, account management, reporting tools, printing of order history, self-printing of shipping labels, and real-time tracking and tracing. The OnTime API makes it possible to connect a live OnTime account with other software systems across the internet in a simple and straightforward way. The API can be used to create, update, and track orders in real-time. This is an extensive online API, providing access to 500+ properties and 90+ functions.